October 2016 was the month of our baby boy’s 1st birthday! 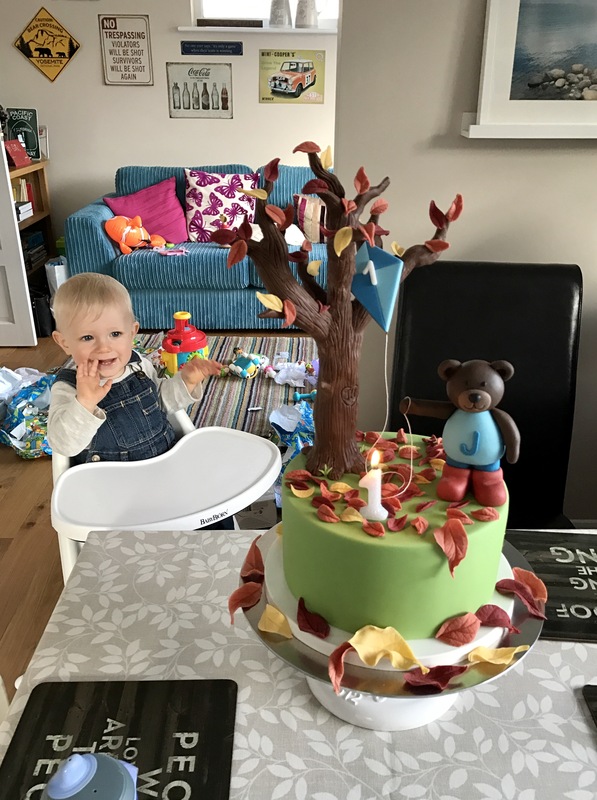 I really wasn’t sure what to do for his cake, but in the end took inspiration from a supermarket magazine cover with autumn leaves on it 🍂🍁 and decided to go with an autumn (or fall 🇺🇸🇨🇦) theme. I wanted to include a teddy bear (for the cute factor!) and find another way to incorporate the Cake Frame, so used it in the design as the internal structure for the tree. Inside was a new cake recipe I hadn’t tried before. If you’ve read my previous posts, you’ll know that I love the Cake Paper Party blog by Summer Stone. She posted a new recipe two weeks before I made this cake, so it was perfect timing to try it out, and it fitted perfectly with the autumn theme too as it was a Pumpkin Spice cake! 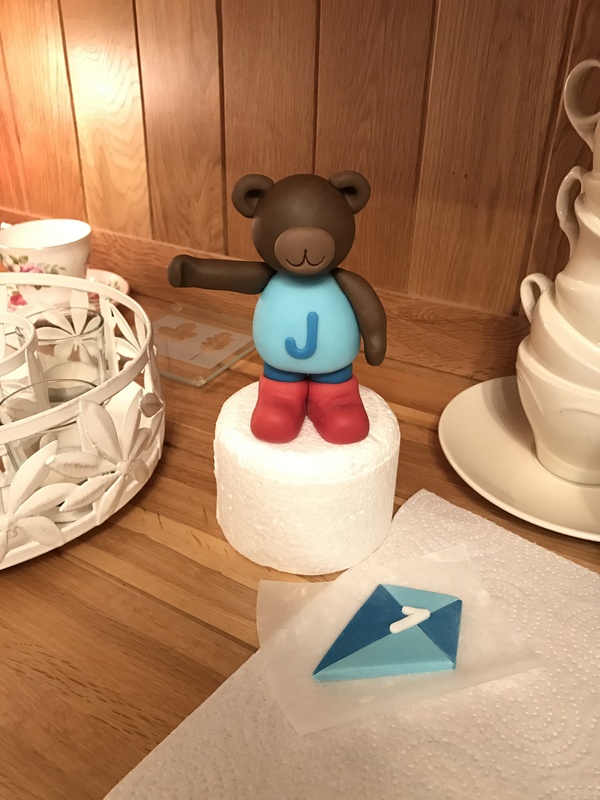 A week before the party I started work on the teddy bear so that it would have time to firm up. 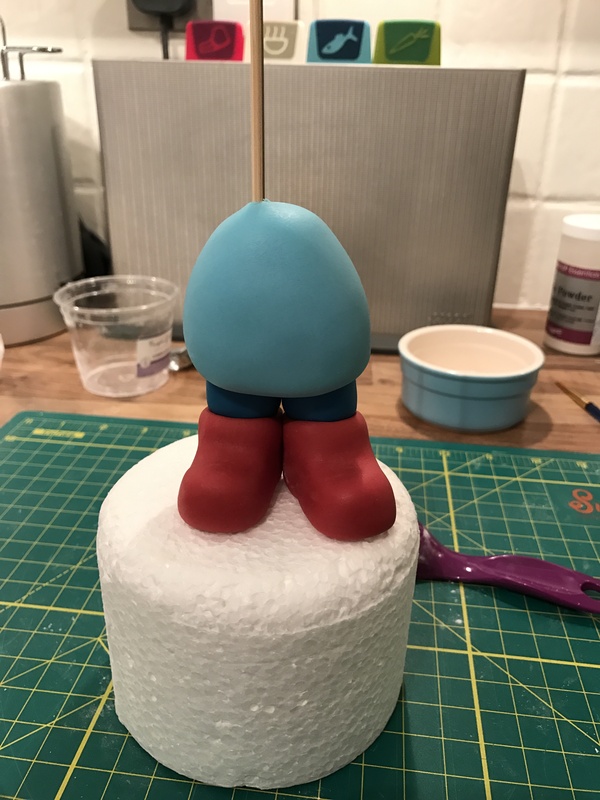 I used Carma Massa Ticino fondant again with tylose powder added in to firm it up. 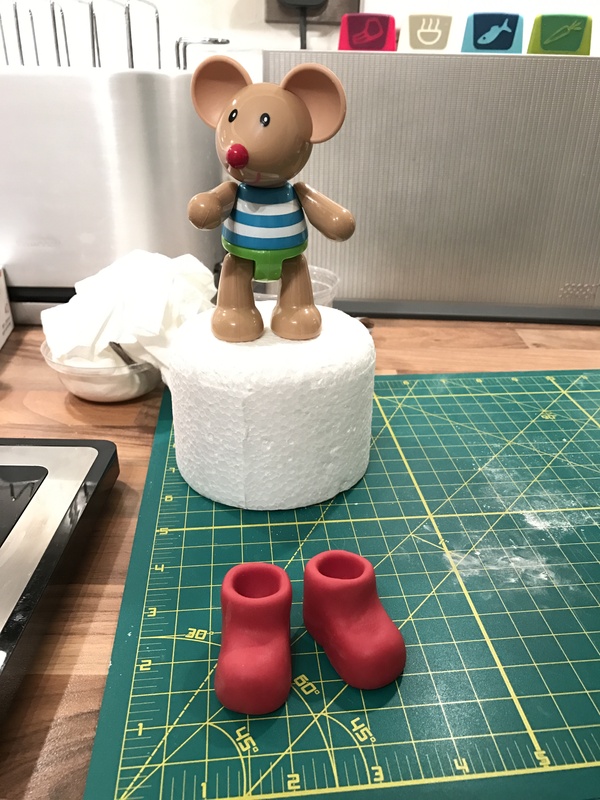 I started from the bottom working upwards and used a toy mouse as rough guide for the size I wanted the teddy bear to be. 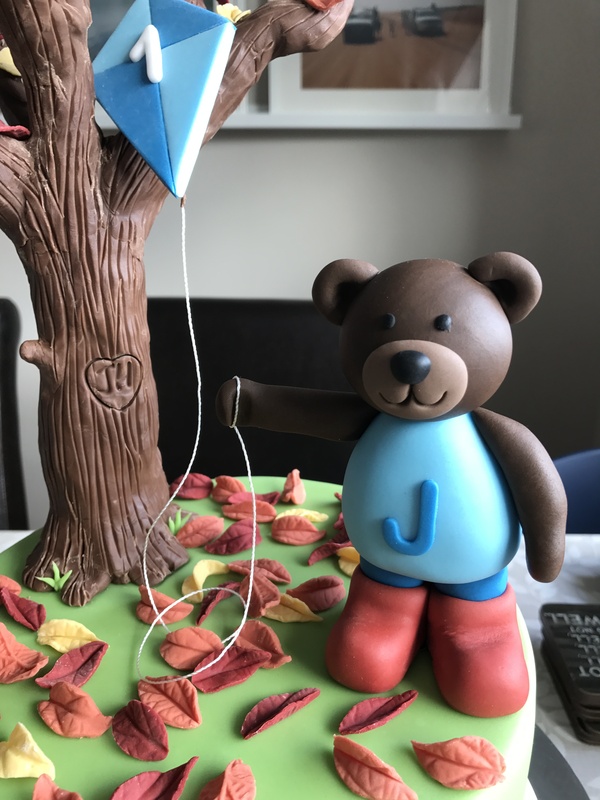 I added a wooden kebab skewer through one side near the centre, so that I would be able to secure the bear onto the cake at the end. Between adding each part I left it for a few hours to firm up so that it would support the next part. Once I’d finished the bear I made the kite by sticking four triangles together and adding a number one. I made the leaves a few days ahead to allow them time to firm up too. 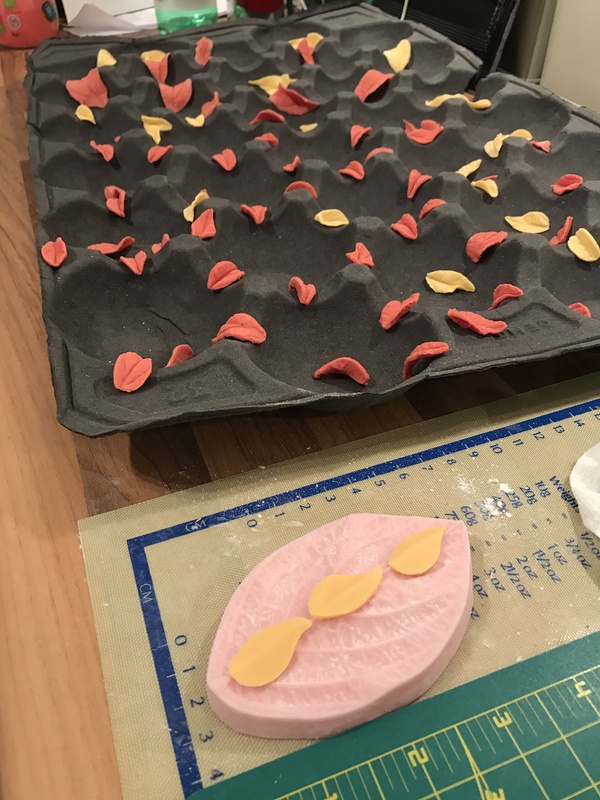 I used leaf cutters and a veiner to add detail, then left them to dry in different positions on a supermarket apple crate mould! For the tree, I constructed a frame out of the Cake Frame to support the structure of it. 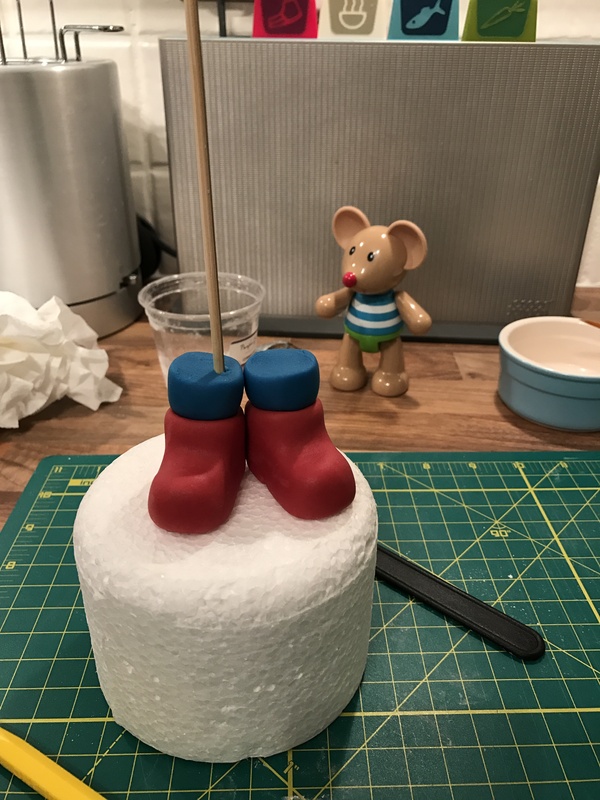 Cake Frame is made from food-safe parts and easily slots together, so is perfect for constructing supports for the cake (I used it on my Mr Potato Head Cake for a gravity-defying structure). 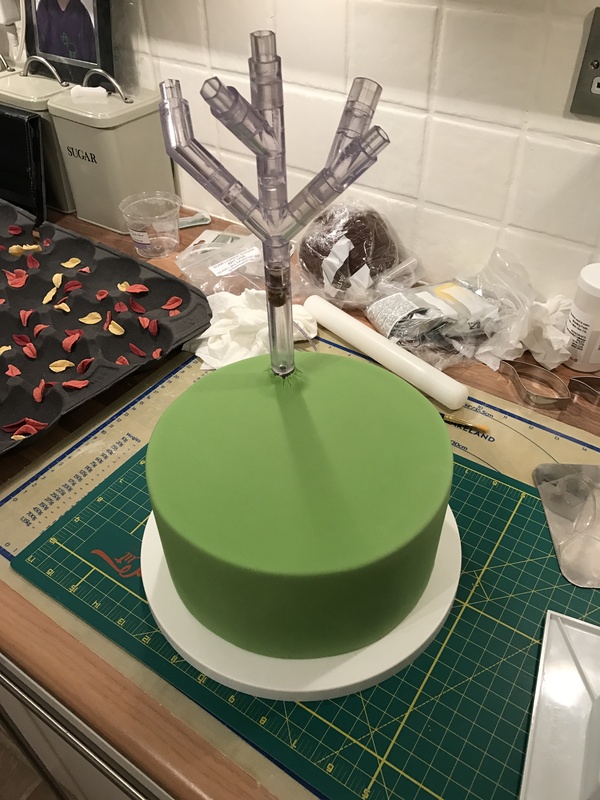 I played around with the parts until I was happy with the shape, and measured to make sure the tree would be the right height standing above the 4″ tall cake. 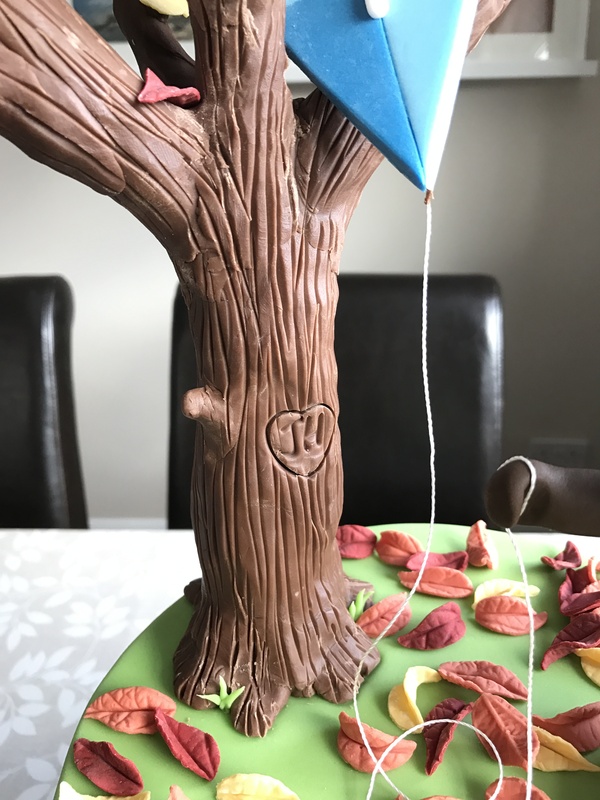 I added a small rod the opposite side of the tree so that the cake wouldn’t move or rotate around the tree, which meant it would stay perfectly centred on the base board. I then took the branches part of the frame off so that I could easily slide the cake over, before reattaching it. To make the tree I used modelling chocolate (made from Wilton Candy melts and corn syrup). I’ve used modelling chocolate a little in the past (on my Mothers’ Day Quatrefoil Flower Cake and Candle & Bow Winter Wedding Cake), but not much for modelling. 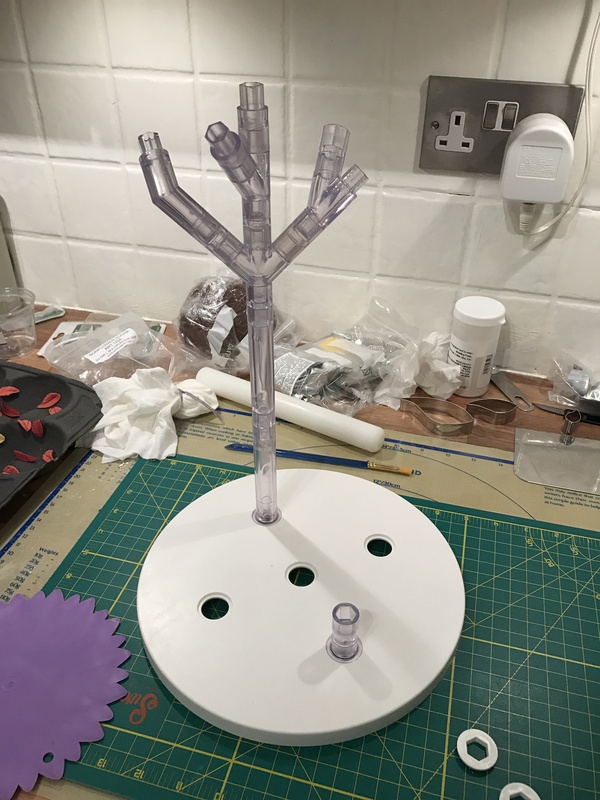 I wanted to use it for the tree as it holds its shape well with less support, so I thought it would work well for the end of the branches which went beyond the limits of the frame. You can also blend the seams together to hide the join lines, so it meant I could add sections of branches and then hide the seams. 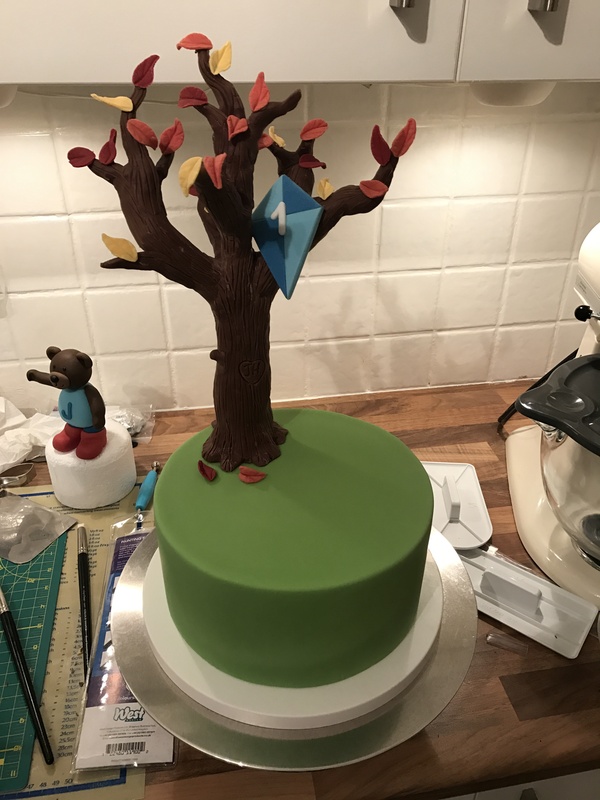 I then added the kite to the tree using royal icing as ‘glue’, and started sticking on the leaves the same way. I coloured the royal icing dark brown so that any slightly visible bits wouldn’t stand out. 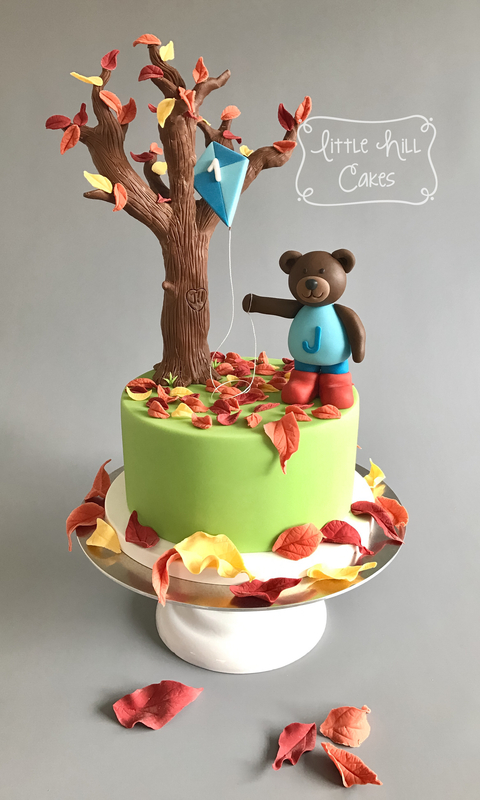 All that was left to do them was to scatter the remaining leaves over the cake and add the teddy bear. I used butchers’ string for the kite string and tied it round teddy’s hand.